Tuesday October 2, 2018 - The Office of the Director of Public Prosecutions was criticised over old cases still pending by a High Court judge in Nyamira. 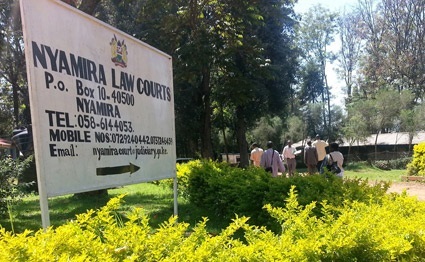 Nyamira High Court Resident Judge, Esther Maina, raised concern after Prosecutor Emma Okok said that witnesses in a 2010 murder case were yet to be brought before the court. Joyce Kemuma Mochere, Eunice Mokeira Otete and Stella Moraa had been charged that on November 6, 2010, at Rigena in Masaba North, they killed Maria Bisieri Opondo after she refused to buy chang’aa for them. The Prosecutor had pleaded with the court for more time to call witnesses once she reached them but the judge overruled the application saying the prosecution was not being serious. “It is unfortunate that the prosecution is not taking this very old case seriously," Maina stated. "We shall, therefore, allow the prosecution only one day to round up their witnesses, including expert witnesses, for further hearing of this case on October 3,” she ruled.